I think Linux can take advantage of podcasts for a better user experience. For example when installing the distribution you could have the option to play a relevant and fun podcast. Compressed with Opus. It would not take to much space on the .iso. Also as a way to engage new users. Getting them to read the Official User Guide it would be nice if there is a complementary podcast where a group of people discuss each of the chapters. I think this would keep them interested reading the whole thing through. 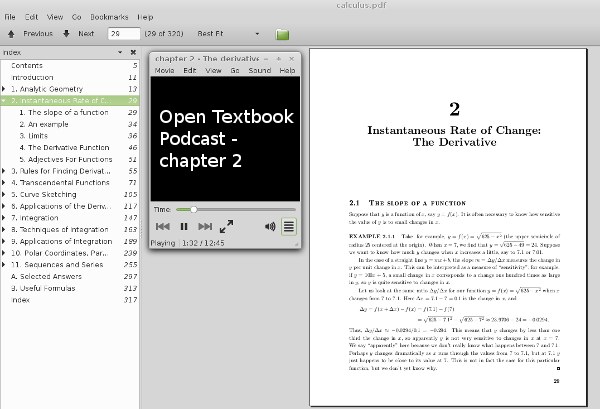 The idea is to take an Open Source Textbook on mathematics, physics, chemistry or biology and make an Linux style inspired podcast series. Here two or more people discuss the theory on each of the topics, problem solving techniques, its applications and more. Even if this is a podcast you can have visual content. Just add links to images/videos referenced in the podcast to your web page. It should make it less expensive then to do a pure video podcast. I think following a podcast for your textbook where they ask interesting questions, where you can learn from good explanations or maybe just get motivation from a fun session could go a long way. My idea is simple. 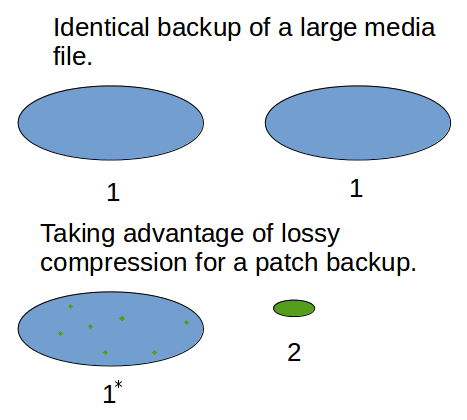 For media that depends on lossy compression it should be possible to ”patch” the media file with a smaller file of same resolution but a lower quality. The backup file is smaller due to more lossy compression. For this to work on image files the format probably need to loose some dependency on the previous block. One error should not affect the rest of the image. On the blocks you then perform some checks. The idea is then that if you encounter a error in the original big image file then you can patch it with the block of pixels in the smaller backup file. The block in the backup file would be of lower quality but look similar. You probable would not notice that the image has been fixed. For a .jpg photo of 3.3MB I saw that I would only need a 350k version. To keep it simple one could store both versions in the same file as an option. For those who don’t make backups I think this would make it easier to recover otherwise lost photos. Wi-Fi not working on your LiveUSB? 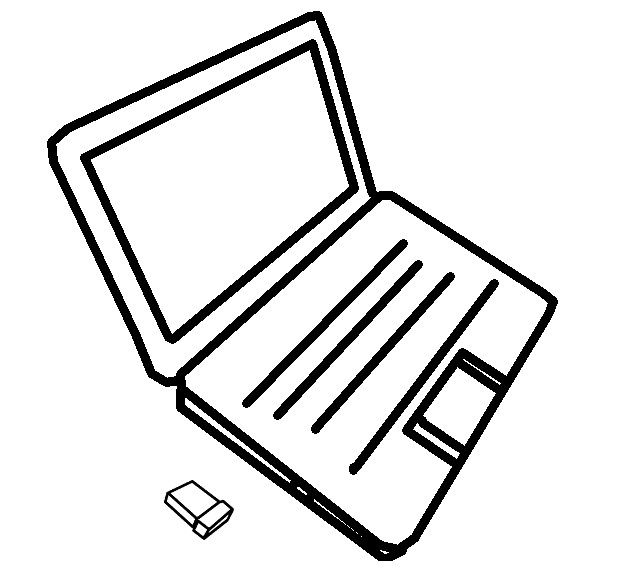 If you need to run a particular LiveUSB on your laptop where the Internet connection through Wi-Fi doesn’t work. I simply find it easier to attach a USB Wi-Fi nano adapter or a dongle. It doesn’t cost very much but be sure to make your Google search first before buying the particular adapter. Choose a stable adapter or dongle that works out of the box. If you make the LiveUSB persistent then you could with the backup dongle install a driver for the internal card if it exists. I thought this could be valuable information for those taking the MOOC Introduction to Linux. The idea is simple. Combine a number of still images into a html5 slide. Together with the podcast this would create a better experience. One reason to do this is the small bandwidth requirement compared to streaming video. The images doesn’t need to be in sync with the podcast either. Three or four images will answer the basic curiosity. A small bandwidth Audio Codec would be Opus. 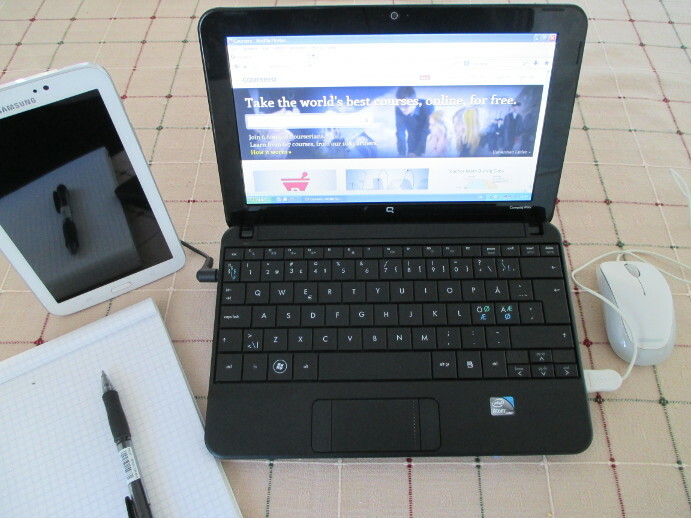 Skype has become very easy to use on tablets and smartphones. You can take the conversation with you in every room you like with no hassle. The idea is then that one could use this for some sort of stress counseling. I believe visual communication could have an effect. The suggestion is therefor that there should exist a service for those affected by stress. Calm professionals who can reduce stress. I hope something like this could be researched. We can easily convert information to a human understandable form when we speak. Why not take advantage of this when we want to teach math, physics and other subjects. The idea is that in our digitized textbooks we put in links to audio recordings explaining the theory part described in the text form. Because audio recordings are much easier to create than video I imagine cost can be kept down. I think a way to increase the completion rate would be to make it easier for the students to find a study partner or group for the course. To get the extra motivation you need. An idea would be to connect to your study partner via Skype. An example MOOC Station would then look something like this. With the Skype connection on a dedicated device like a smartphone or tablet. You can keep it running for the whole session without interruptions and why not take “fika” break together every once and a while. We all love the variation that comes with Linux. But if you could why not make it optional for those who want the same experience when changing distribution. I wonder if a version of the operating system could be run from the browser and control the native one. A simplified version would mean that a novice could operate a lot of different desktop environments. 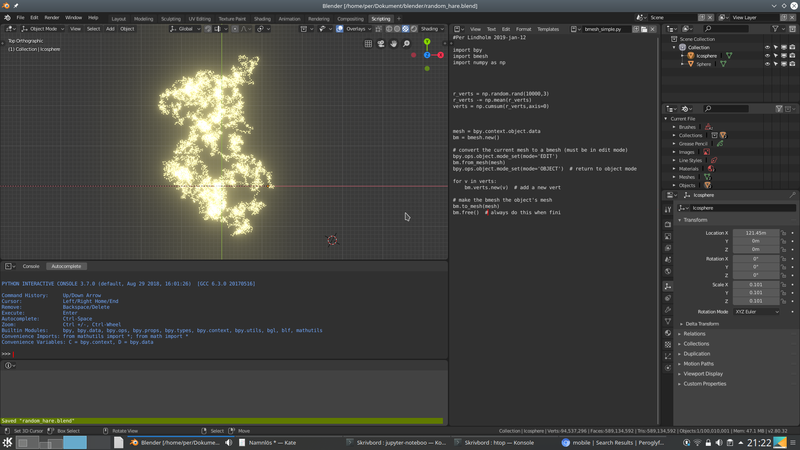 Like GNOME, Unity, Cinnamon, MATE, KDE, Xfce, LXDE and Enlightenment. If a larger group of distributions would work together on something like this I think it would make it easier for those distributions to exist in the workplace. With this you could take advantage of the creativity in web development and a non changing experience for those who want that. 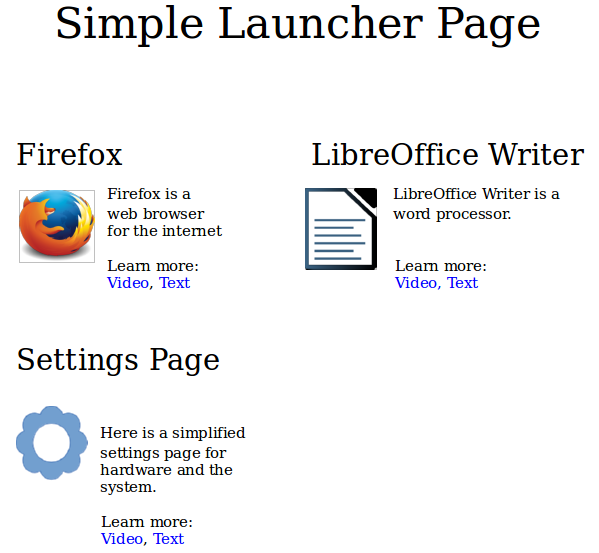 Example of a launcher although not very creative. After watching the below video on machine learning. Which showed some sort of generation. I imagine that this could be replicated for 3D objects as well. Say you let the matrix-setup train on a biological part. With many variations of this part the setup will have learned what it should look like. Then as we saw in the video. 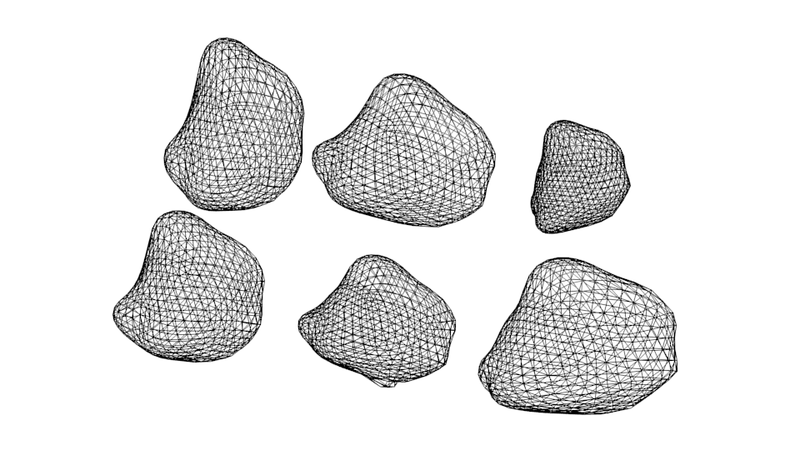 The setup can also generate different shapes of the same object. I don’t know the implication for evolution. I guess however the genetic makeup would also include support data (the learned matrix). To help generate biological elements like the trained part. This thought experiment I think shows how evolution can produce so much variation. Without the energy cost due to error. Below is a link to the Neural Network video and a would be training set for an arbitrary biological part. Would be training set for an arbitrary biological part. Here is my idea for language learning. You can easily combine both text and audio into a dual textbook. To be read on a smartphone or a tablet. The idea is that you could listen to a small part of the text at a time and then read the same text aloud. This way you get help reading the text and pronouncing the words. Its not meant for text to speech synthesis but for actual human voice. The idea is to help small business in developing areas with non internet dependable educational videos. Either to improve or to help someone start a business. 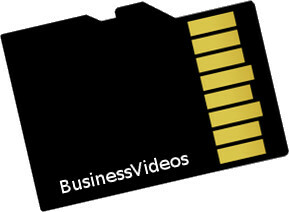 The videos are to be included on the microSD. The maximum size of the microSD is 32 GB which is more than enough. This way you don’t need an internet connection. Just plug the microSD into the phone or tablet. Videos could include sewing, haircuts, cooking and more. I think you could enhance a lot of sites with voice overs for official articles. Maybe some blogs would also find it interesting. They need not be so complicated. Just someone who reads the article. Clicking on a voice recording would be beneficial especially on mobiles with small screens. With so much to read on the Internet sometimes hearing the text is welcome. It would nice then if adding an audio sample is as simple as adding an image. A few tips using Audacity. To remove high pitch noise use the “low pass filter”. Look at “plot spectrum” to see if you got the desired effect. Then apply the “noise reduction” process. A while ago I played around with my gmail. The problem I had was that every email from facebook to Linux ended up in the one and only inbox. The solution which has to get a lot easier is to have user rules that automatically puts emails into different folders (labels). Remembering how many unread emails you have under each label can be difficult. Here you need some additional solution to notify the user of new emails. Since many people have their email with their internet service provider. I hope this kind of solution becomes somewhat of a standard. With the huge progress in solar energy capture there should be a potential for its use in cleaning the environment. Water being essential to life would be a good place to start. I think solar energy could be of use where the location is out of reach from the grid and the otherwise burning of fuel is contra productive. Going from time limited measures to more continuous cleaning would reduce the time and be more effective. I think the next step after the introduction of Internet ready Solar Tablets for developing countries like India and others in Africa is to establish learning communities around Open Source Textbooks. Free books with an open license that makes it possible to keep the book up to date. If successfully implemented these communities could improve the learning experience for the student. Being able download an Open Source Textbook and ask questions on the content of the book, read alternative explanations, view video and cooperate with others on-line would go far. I think this is where the innovation needs to be, not making the textbook look like something that fell out of a Hollywood movie.